This is another memory challenge. I made this with a friend from work, Matt Talbert, during our lunch break. Matt did all the graphics and I did all the programming. Just a note: This j2me midlet requires a bigger display to look like it does in the picture below. On my SonyEricsson T610, all I can see is the playing board. The game works the same except the score and best score are only displayed after the game ends. How to play: You can use either the navigation buttons/joystick on your cell phone or the number keys 2,8,4,6,5 to navigate the yellow cursor and select squares. There are 36 tiles on the board, 18 of them being unique. When you click on a tile, it will get turned over so you can see what symbol is behind it. You then pick another tile on the board and you'll see the symbol behind that one. 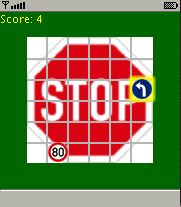 If the symbols are the same, the tiles will be removed from the board. If they are wrong, they will be turned back over so you can't see the symbol. Every time you turn over 2 tiles, your score goes up by 1. 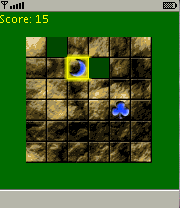 The object of the game is to remove all the tiles (by finding matches) in the least amount of turns. To exit the game, you may have to hold down the back button on your phone. Ivo Podbrany from the Czech Republic sent me these alternative graphics for the Cocentration game. I'll probably eventually put both sets of graphics into a single game, but for now I'm going to leave them separate. For instructions for playing this version are identical to the version of the game above.